The city of Santa Clarita will host a public ribbon-cutting event to celebrate the completion of the Sierra Highway Pedestrian Bridge and Street Improvement Project on Friday, March 29, at 10 a.m. The event will be held at the bridge, located over Sierra Highway north of Golden Valley Road. Parking will be available in the shopping center adjacent to the bridge, on the southeast corner of Sierra Highway and Soledad Canyon Road. The Sierra Highway bridge looks similar to the bridge over McBean Parkway pictured above. 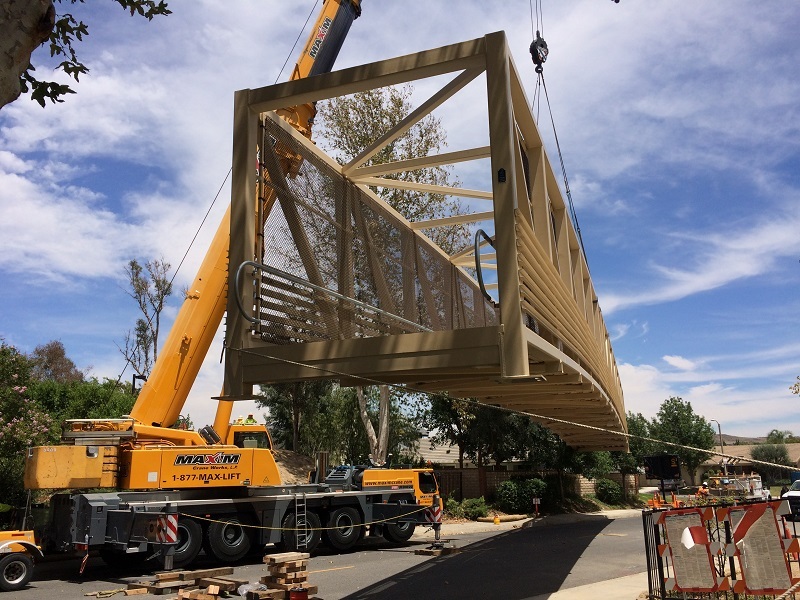 The federally funded Sierra Highway Pedestrian Bridge project, a partnership with Caltrans, brought the first paseo bridge to Canyon Country. The pre-fabricated steel truss pedestrian bridge now provides safe-crossing over Sierra Highway. The project also improved traffic circulation and trail connections at the intersection of Sierra Highway and Golden Valley Road. Multiple street improvements were made on the west side of Sierra Highway, including construction of a new bus turnout, and a right-turn lane from southbound Sierra Highway onto Golden Valley Road. As part of this project, the intersections of Sierra Highway and Rainbow Glen Drive, and Sierra Highway and Golden Valley Road, also received pavement maintenance, traffic striping and signal modifications to allow for U-turns. New street lights will also be installed. This project is part of the city’s Santa Clarita 2020 plan under the theme of Building and Creating Community. To attend the event, please RSVP by Wednesday, March 27, by contacting Kathleen Herrera with the city at kherrera@santa-clarita.com or at 661-255-4939. For additional details about the project, please contact Jackie Lillio from the city’s Public Works Department at 661-290-2290 or at sierrabridge@santa-clarita.com.